Author(s): Abuzar Khan, Mohd. Asim, Umair Alam, Mohd. Yusuf Khan, Niyaz A. Mir, Mohd. Muneer. Department of Chemistry, Aligarh Muslim University, Aligarh-202002, India. 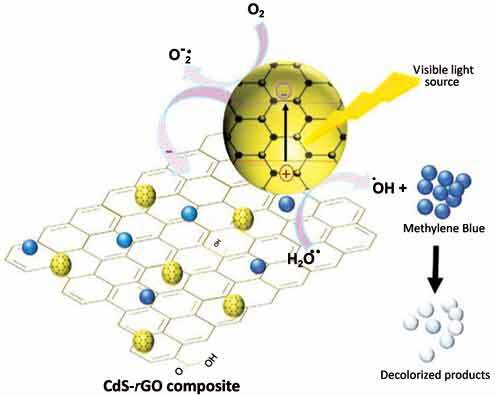 The present study deals with the synthesis of visible light active CdSrGO hybrid composite by UV assisted photoreduction of Graphene Oxide (GO) and its application for the photocatalytic decolorization of dye. The synthesized samples of CdS and CdS-rGO composites were characterized by the scanning electron microscopy (SEM) and X-ray diffraction (XRD) to study the morphology and phase characterization of the samples. The developed hybrid composite of CdS-rGO was studied for both its photocatalytic activity as well as for adsorption behavior using methylene blue (MB) dye as a model pollutant. The photocatalytic response of the composite was also compared with commercial TiO2 (PC500 and TTP) powders and was found to be higher than these photocatalysts. The effect of rGO concentration on adsorption capacity and photocatalytic response of CdS-rGO composite revealed that rGO plays an important role in the enhancement of photocatalytic performance of CdSrGO composite for the photocatalytic decolorization of MB under visible light irradiation. Keywords: Cadmium Sulfide, Dye, Graphene Oxide, Hybrid composite, Photoreduction, Visible-light. Affiliation:Department of Chemistry, Aligarh Muslim University, Aligarh-202002, India. Keywords:Cadmium Sulfide, Dye, Graphene Oxide, Hybrid composite, Photoreduction, Visible-light. Abstract:The present study deals with the synthesis of visible light active CdSrGO hybrid composite by UV assisted photoreduction of Graphene Oxide (GO) and its application for the photocatalytic decolorization of dye. The synthesized samples of CdS and CdS-rGO composites were characterized by the scanning electron microscopy (SEM) and X-ray diffraction (XRD) to study the morphology and phase characterization of the samples. The developed hybrid composite of CdS-rGO was studied for both its photocatalytic activity as well as for adsorption behavior using methylene blue (MB) dye as a model pollutant. The photocatalytic response of the composite was also compared with commercial TiO2 (PC500 and TTP) powders and was found to be higher than these photocatalysts. The effect of rGO concentration on adsorption capacity and photocatalytic response of CdS-rGO composite revealed that rGO plays an important role in the enhancement of photocatalytic performance of CdSrGO composite for the photocatalytic decolorization of MB under visible light irradiation.